In 2016, 18-year-old Sami Ghandour left Lebanon with the intention of playing basketball in Canada. 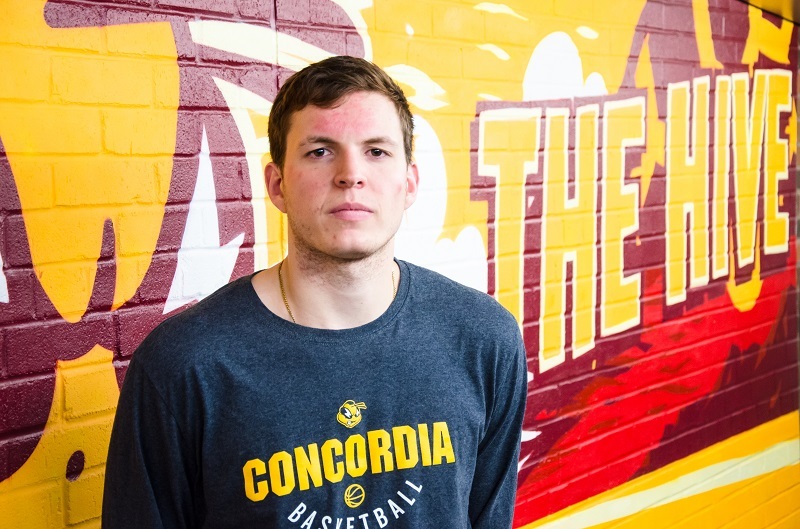 Today, he is a member of the Concordia Stingers men’s basketball team. Ghandour wears a brace on his shoulder post-surgery. Photo by Gabe Chevalier. Ghandour was actually born in Fergus, Ont., but grew up in Phoenix, Arizona. He moved to Lebanon at 13 years old for high school. Another thing that marked the Stingers’s forward in his debut with the team is that he was younger than the other first-year players. Stingers head coach Rastko Popovic also noticed how Ghandour’s age had an effect. However, he said the forward’s progression with years has been impressive. Although Ghandour’s main job is to get rebounds, he still contributes nearly 10 points per game. Photo by Clare Redman. Ghandour explained that all he needed at the beginning was adaptation. He said it helped him a lot to get to where he is today, especially when he arrived in Canada uncertain about the future of his basketball career. Rebounds are something Ghandour excels at. Players are statistically awarded a rebound when they pick up a loose ball that rebounds on the hoop of a basket after a missed shot. Ghandour explained that the Stingers coaching staff put a lot of importance on them, especially in the position he plays. Ghandour missed the first two games of the season due to a shoulder injury, leading to his first-ever surgery, which was a scary experience for him. Ghandour came back on Nov. 22, 2018, when the Stingers played the McGill Redmen. For the occasion, the forward finished the game with a team-high nine rebounds. Popovic added that Ghandour’s presence in the lineup makes a big difference on the team’s overall game. With three games left in the regular season, Ghandour said the team is taking it one game at a time, with the goal of making it to the nationals. However, he admits that an all-star mention would be something to be proud of. Main photo by Clare Redman.